This week the Commission began its evidence drive. Having travelled the country, it's clear that communities are concerned about extremism but also that the picture is changing and it's complex. As Sara has written this week, we need to look at the changing tactics of extremists. We've heard how the old stereotypes don't always apply - extremists are more professional, using and abusing human rights language and exploiting social media. Sara has said we need to shine a light on victims of extremism - and this week we had a useful discussion with the Victims Commissioner. We also need to carefully consider society's response to extremism. We have met many inspiring individuals and groups challenging extremism in their communities - with many receiving more abuse than support. How can we better support them? How can we improve what is a polarised debate, and help people feel less nervous about discussing the issue? If we want to do more to challenge extremism we need to understand it better. That is why we are now seeking to gather evidence on all forms of extremism. This week we began this work. The first stage is all about scoping. We are currently working with social research experts to evaluate the current academic evidence. We brought our new, independent Expert Group together for the first time for an update on the Commission's work so far, and to start looking at how we answer some of these big questions. It is clear that we need to draw out communities' views on extremism, and we had a positive discussion about how we do that through out the evidence drive. We also met with a wider group of experts, practioners and civil society groups for a workshop on their view of the gaps in the evidence and what we need to prioritise. Again this was a really constructive discussion, demonstrating the potential power of collaboration. The next stage will see the Commission launch a public call for evidence, commission new research and work with Government and other public bodies to collect information. As part of that we will be publishing more information on the scoping phase. And underpinning all this will be lots more engagement, lots more conversations and lots more constructive debate. Please follow the blog to stay in touch. 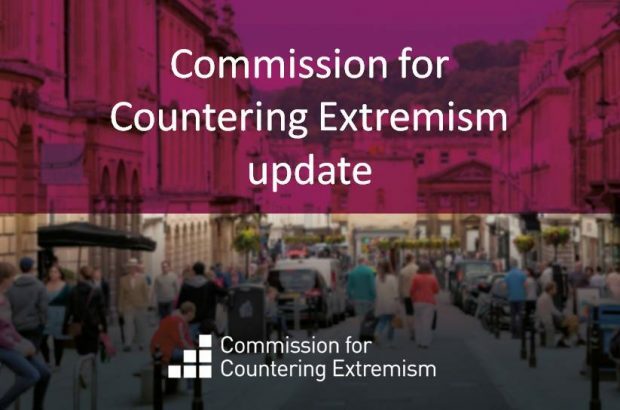 This blog has the latest information and updates from the independent Commission for Countering Extremism. It includes details on our progress and plans, who we’re engaging with, media statements, and comments from the Lead Commissioner, Sara Khan.